I Got Rhythm * 'S Wonderful * They Can't Take That Away from Me * I'll Build a Stairway to Paradise * Love Is Here to Stay * Embraceable You * Fascinating Rhythm. 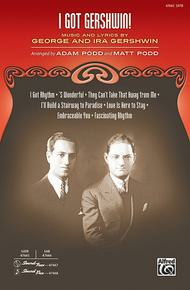 Composed by Ira Gershwin and George Gershwin (1898-1937). Arranged by Adam Podd and Matt Podd. Performance Music Ensemble; Single Titles. Alfred Pop Choral Series. Form: Medley. Broadway; Great American Songbook; Secular. Choral Octavo. 24 pages. Alfred Music #00-47665. Published by Alfred Music (AP.47665). This seamless 41/2-minute tour through seven timeless standards pays tribute to the American songwriting team of George and Ira Gershwin. Smart voice leading and classic choral arranging techniques remain faithful to the cherished melodies and jazz-influenced harmonies. Listen closely for additional Gershwin themes tucked into brief interludes between the enchanting songs. Live clarinet, bass, and drums (in the opt. SoundPax) add an elegant touch in concert.